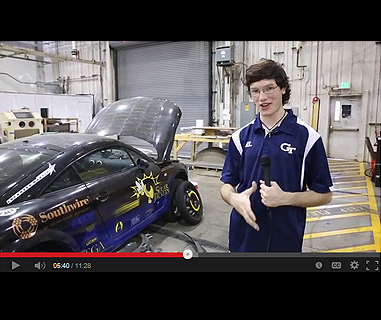 Take a mini tour of the George W. Woodruff School of Mechanical Engineering at Georgia Tech with Nick Selby, ME sophomore. Famous for his GT convocation speech and words, "You're at Georgia Tech, you can do that," Nick showcases his home school of Mechanical Engineering...where we ARE doing that! Steve Dickerson, Professor Emeritus, began at Tech in Fall 1965 as an Assistant Professor and retired in 1996. Dr. Dickerson's current research is entirely in the field of high-performance, computer-controlled motion devices (robots) for manufacturing and service sector automation. His research is funded by the National Center for Manufacturing Science, the Ford Motor Company, and a couple of Georgia Tech spin-off companies. Enjoy his ME story. The 2013-2014 academic year marks the 125th Anniversary of the George W. Woodruff School of Mechanical Engineering at the Georgia Institute of Technology. 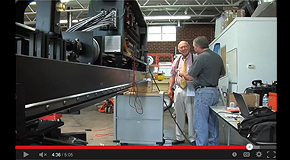 Watch as Bill Wepfer, Chair of the Woodruff School, takes a look back and ahead. 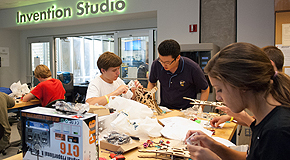 Visit http://me125.gatech.edu/ for an interactive timeline, event details, a video library, and an opportunity to give to the Woodruff School. 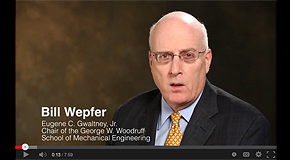 The George W. Woodruff School of Mechanical Engineering 2012-2013 Annual Report has been released. Learn about last year's enrollment and degree statistics, our new undergraduate curriculum, major faculty awards, the research happenings of the school, and much more. Calling all alumni...are you interested in brushing up on your Statics skills? Would you like to know what’s going on in the Woodruff School lately? 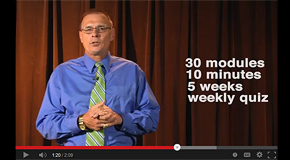 Want to be among the first to participate in a free ME massive open online course (MOOC)? You can get all this PLUS a commemorative ME125 gift if you register to take "Applications in Engineering Mechanics," taught by our very own Dr. Wayne Whiteman beginning November 4. This past week, we hosted our annual fall Advisory Board meeting on campus. This provided me with the opportunity to give my “State of the School” presentation. We had a spectacular year!